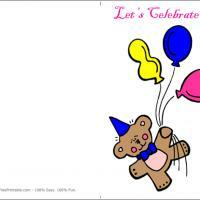 Who can resist the very cute bear on these free printable cards? These printable birthday cards promise you will sail away on your balloons along with a fuzzy new friend. With bright colors, a soft bear, and plenty of room for additional decorations and greetings, this card is the ideal way to celebrate a birthday or to use as an invitation to a party. Whoever receives this will truly love this birthday card. Make sure and add a cute message to go along with this cute bear and show your goodwill on this special day. These printable birthday cards are great to send to children and even to a few adults as a token showing how wonderful you think they are. Print these out today and enjoy! It is time to celebrate someone's birthday. Are you ready? Our little fuzzy Cute Bear free printable birthday greeting card is a great one to share birthday wishes or to even use as an invitation to the birthday party. The cute bear all decked out in his royal blue birthday hat and matching tie has hitched a ride on some colorful balloons just in time to arrive on time for the party. Take a few moments before printing the cards and take advantage of our custom print feature. It is so easy to personalize each card before printing them right at home. A fuzzy Cute Bear dressed in his fancy blue birthday clothes has caught a ride on the strings of three colorful balloons to float on in with celebration wishes for the birthday guest. Your children will enjoy sending and receiving this cute little card. The inside of this free printable card is blank. It is a perfect canvas for them to joyfully add their own decorative touches with glitter, stickers, and colored markers. Or,you can easily add images from our varied selection of custom printing options to personalize this sweet and lovable Cute Bear birthday card with any message you wish.